It even outshines Microsoft's Surface Book, at least aesthetically. Beauty. Power. Money. The Porsche Design Book One laptop, unveiled Monday night at Mobile World Congress, expresses all of these things within its high-end design. The Porsche Design Group (owned by the same parent company as automaker Porsche AG) already crafts watches, headphones, and more for wealthy clientele with refined tastes. When the Book One ships in April for $2,495, it will present the first real challenge to Microsoft’s Surface Book in what we’ll call the Trophy Laptop category—wherein you buy the PC not because you need it, but because you can afford it. The Book One does, indeed, set new standards for laptop beauty. (The laptop is designed in Germany and manufactured by Quanta Computer in Taiwan.) However, it clearly sacrifices some power for the sake of looks—and the price point. With all the PC parts in the display, the Porsche Design Book One naturally has vents along the screen’s sides. The company deserves credit for bringing some beauty to a challenging form factor that faces incessant pressure to be slimmer and lighter. The Book One starts with a brushed-aluminum shell and chiseled corners, elements you’ll find on other high-end laptops. 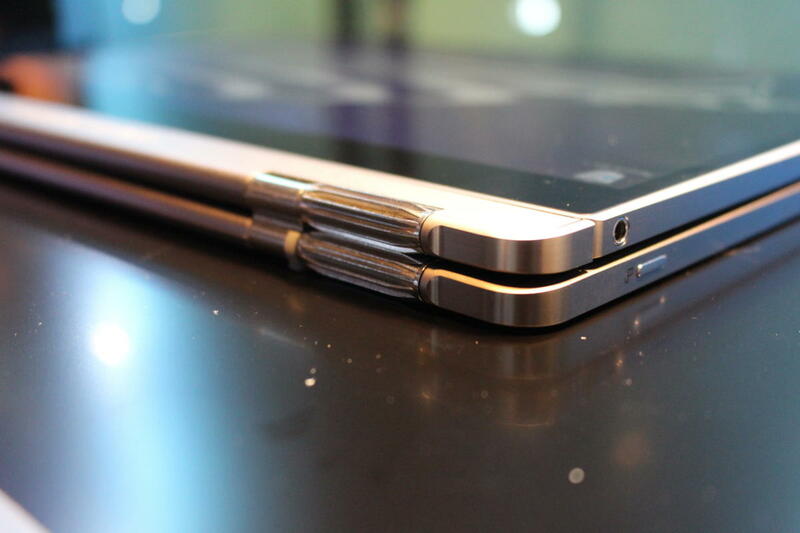 It’s also extremely thin, at just 15.9mm (0.63 inches). Next, it adds hints of Porsche automotive heritage in details such as the radiator-like ventilation grilles on the sides of the display, and especially in the 360-degree hinges. The gearlike hinge mechanisms are polished stainless steel. You can admire how they roll smoothly over each other and keep the two halves closely matched. That’s thanks to a small additional mechanism that Porsche calls the intelligent distance ring, which deftly tilts the hinges around each other. That’s far better than the awkward up-and-over you see with most laptops, and even the quirky, loopy turn the Surface Book makes. If we’re talking aesthetics, however, that little ring (which you can see in the middle of the hinge) is simple white plastic and looks out of place among all the metal bling. 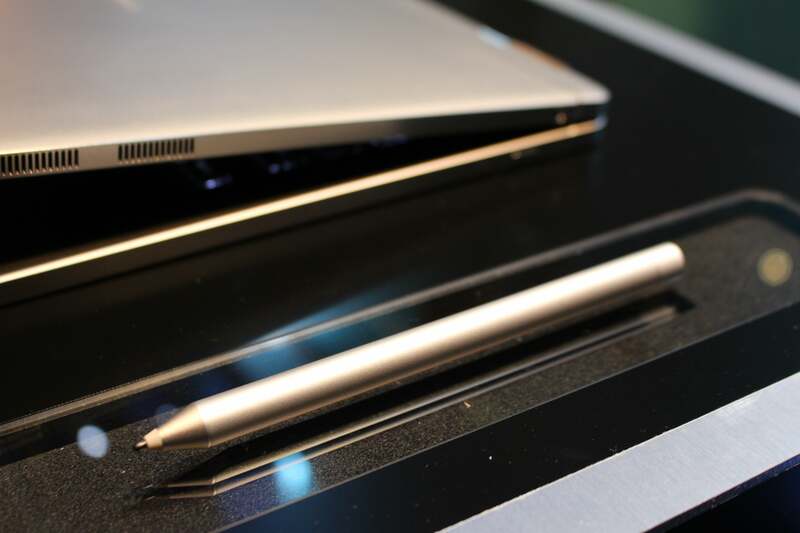 Of course the pen that comes with the Porsche Design Book One is also a high-end design, made of aluminum. 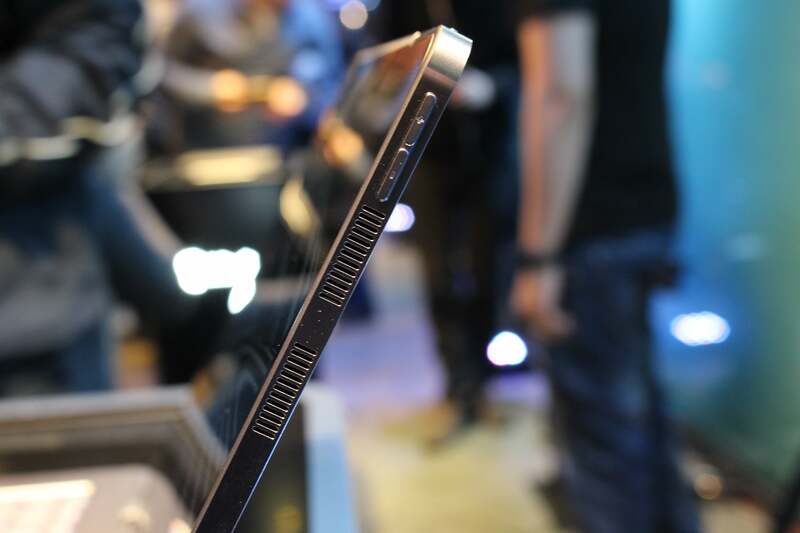 The Book One is the first laptop to have both a 360-degree hinge and a detachable display. The glossy IPS screen, protected by Gorilla Glass 4, has a sky-high resolution of 3200x1800 pixels, and a 5MP front camera plus an infrared camera for enabling Windows Hello face authentication. The beautiful (of course) aluminum stylus, designed with Wacom, sticks to the right side of the display using magnets. 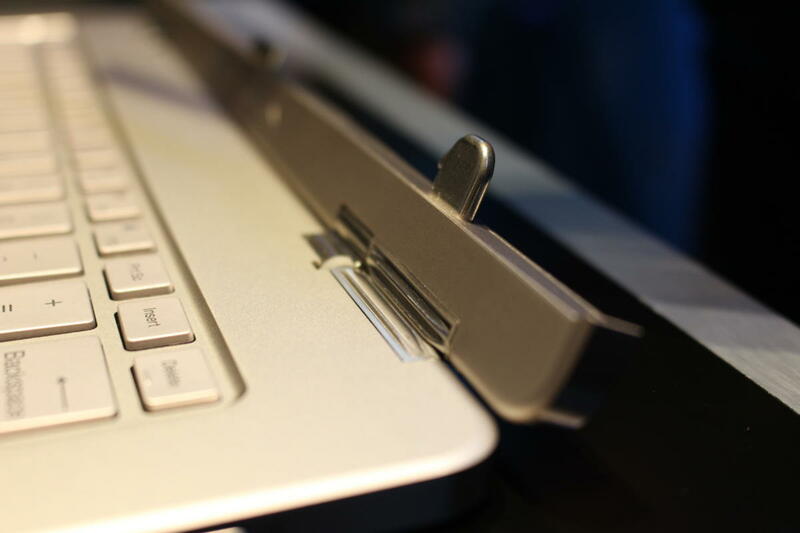 A small button on the right side of the Porsche Design Book One’s keyboard releases the display. You detach the display by pressing a small button on the right side of the Book One. A small light on the bottom of the screen turns green when the display is ready to be released. You pull it up and off fairly easily, leaving a slender bar attached at the hinges. 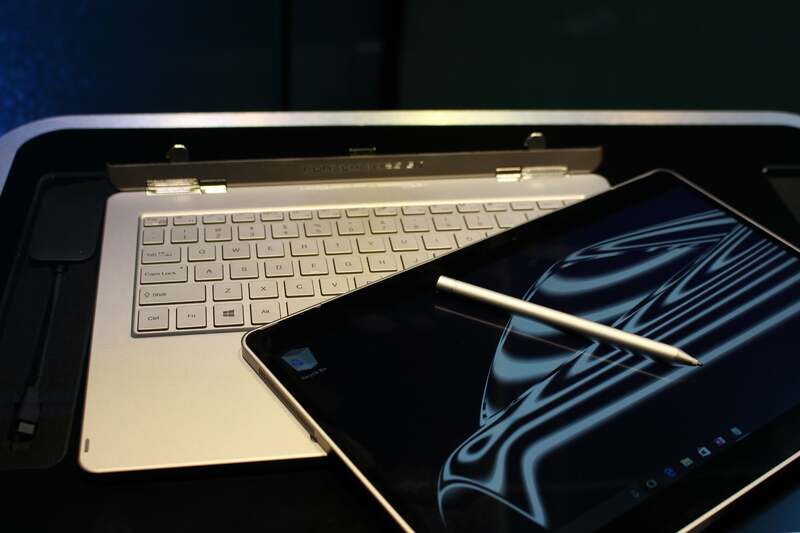 The lower half has a full-size backlit keyboard and a Microsoft Precision Touchpad, which can accept an advanced set of taps, touches, and gestures for easier navigation. When you separate the Porsche Design Book One’s keyboard from its display, a slender top slice with small tabs remains. Most of the computer, of course, is squeezed in behind the display so it can function independently as a tablet. The main specs include Windows 10 Pro and an Intel 7th-generation Kaby Lake Core i7-7500U processor paired with 16GB of LPDDR3 RAM (at 1,866MHz). The 512GB SSD is roomy and fast. The one thing that isn’t top-of-the-line is the graphics. For a brand so closely associated with high performance, I expected the Book One would have discrete graphics. Instead, it has Intel’s HD Graphics 620, which is a pretty good solution, but nothing like the discrete Nvidia chip you get with the Surface Book SKU closest in price to the Book One. To be fair, however, there’s only so much the Book One could do with the space it has (it’s a little smaller and thinner than the Surface Book), and it would have been difficult to build a discrete GPU into the display half without a lot more ventilation and other compromises. The Porsche Design Book One is shown with its keyboard and display separated, plus its included pen. On the other hand, the Book One offers a total of 70Wh of lithium polymer battery with a projected life of up to 14 hours. That battery is split: 25Wh in the display, and 45Wh in the keyboard. Porsche Design says you can charge the unit fully within two hours. As hard as it is for PC enthusiasts to admit, many users would willingly trade some performance for longer battery life, and that’s part of what’s going on with Book One. We’ve had distinctively (okay, garishly) styled gaming PCs for years, and a few mainstream PCs that have taken the time and resources to be aesthetically pleasing. 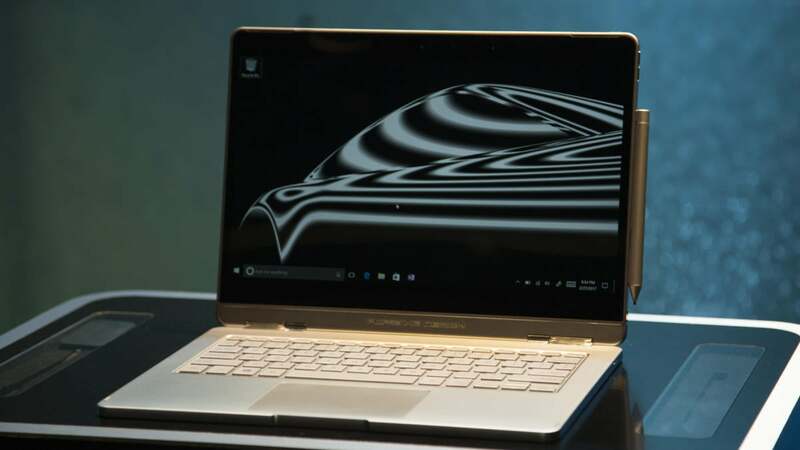 Having a non-computer company like Porsche Design come in with a high-style product like the Book One, however, confirms that people are willing to pay more money for pretty PCs. Hardware enthusiasts may grumble about a compromise or two, but this PC is really speaking to a different audience.